I used to drink a lot of Chardonnay. And then I drifted away from it. I became so tired of the heavily oaked California wines – I used to feel like I was lucky that my mouth wasn’t full of splinters after a glass or two! Every now and then I’d have a French wine that I loved but I didn’t really know enough to look for a white Burgundy when perusing the wine shop aisles. I still have a hard time remembering which varietals come from which regions, although I am catching on… And so I slowly drifted off to other whites like Sauvignon (Fume) Blanc, Pinot Gris/Grigio, Pinot Blanc or the dry Rieslings that are becoming easier to find. Every now and then I’d also have a Washington Chardonnay that caught my interest but they always seemed a bit expensive to me or those in my price range were a bit blah. And then, a few years ago, I tasted an Oregon Chardonnay and I fell in love all over again! Not that every Oregon Chardonnay is perfect by any means! But, in general, most of the winemakers in Oregon use stainless or only keep the wine in oak for a short time. This allows the beautiful flavor of the grape to shine through. Many of the Oregon wines are also rather spendy – most producers there are on the small side and the hand-crafted wines come at a price. Plus, I don’t find as many of them as I would like here in Washington. But that seems to be changing. 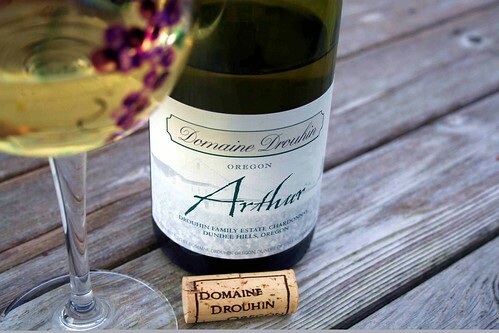 I recently picked up a couple bottles of a wine I first learned about when I visited the Domaine Drouhin estate a couple years ago. All of Domaine Drouhin’s estate wines are named for Véronique Drouhin’s children. She is the winemaker and has been since the winery first started producing. Her wonderfully crafted wines are a delight. Today we are talking about her Chardonnay, Arthur. This is a wine blended from several grapes some of which have been on stainless steel and some have spent a short time on oak. The 2005 wine is a clear butter yellow. The nose is light and floral. In the mouth it is clean, crisp, almost lemony but not tart. I tasted a bit of pineapple and maybe even a little vanilla that brought out a richness but yet there is an acidity that keeps it all in balance. This wine is delightful on its own or pairs well with a variety of foods such as cheese, roasted chicken and seafood. This 2005 allotment is hitting stores now so if you are interested in trying it don’t wait long! I have no doubt it will sell out long before the demand has been filled.